Born in Pittsburgh, Pennsylvania. In Dallas, Texas since 1963.. Summer home and studio Estes Park, Colorado. Education by scholarship to Carnegie Tech (now Carnegie Mellon Univ.) and Indiana University of Pennsylvania. Graduate degree, MA from Southern Methodist University. Other graduate hours from Univ. of Pittsburgh, Rutgers University, Univ. of North Texas and Rhode Island School of Design. For many years taught in public and private schools, adults and children. Has written many articles for art journals and an invited chapter in a book. Now painter and printmaker with studios in Texas and Colorado. Prints and paintings are in private and commercial collections in the US and in Europe. She has won awards and exhibited widely in this country as well as in Paris, France; Milan, Italy; Bejiing, China; Ephesus, Turkey; and Shimonoseki, Japan. In 2008 Denmark accepted three Rocky Mountain prints in the Naesvted Mini Print Exhibition from March 29-April 20th in the Rennebaeksholm Arts & Cultural Center in Naestved, Denmark. They then became part of the grafisk vaersted/ Naestved print studio for artists permanent collection. SELECTED COLLECTORS: The Blaffer Collection of the University of Houston, TX; North Coast Medical Supply Co, Morgan Hill, CA. ; Technology Studios, Dallas, TX; Frost Bank, Fort Worth, TX. ; Standard Federal Bank, Troy, MI; Clover Partners, Dallas, Tx. ; Arlington Orthopedics, Arlington, TX; Advancial Co., Dallas, TX. ;Dr and Mrs. Edward Nieh, Austin, TX, Dr. and Mrs. E.K. Poole, Austin, TX; Gloria and William Ballamy, Reading, PA; Donald Stitt, Stahlsburg, PA; Dr. Bronwen Williams, Rockville, MD. ; Dr. and Mrs. James Livingston, Williamsburg, VA., Dr. Linda Tobey, Washington, D.C., Dr and Mrs John Wright, Rockwall, TX., Dr and Mrs. John Donaldson, Williamsburg, VA.; Cynthia Revko, Dallas, TX. ; Windle Turley, Attorney at Law, Dallas, TX; Sybil Barnes, Estes Park, CO; Dr. John Maguire, Dallas, TX. ; Gainor Davis, Dallas, TX.;Dr. Rolf Huisgen, Munich, Germany; also in other USA and European collections. SLMM, Art Institute of Houston, Houston, TX, Oct. 1st- 31st, 2004, Houston, TX. and Showplace Gallery, Richardson, TX., Feb 2nd – 29th 2005; SHADOWS AND LIGHT, Estes Park Convention Center, Estes Park , CO, Mar. 6th-Apr. 30th 2005; HEALING ENVIRONMENTS, SLMM, Blue Moon Gallery, Hot Springs, Arkansas, Juror: Helen Phillips, Apr.23rd-May 29th, 2004; THE INFLUENCE OF ROSENBERG, invitational of former students, including Andy Warhol, Phillip Pearlstein and Bennard Perleman, of Samuel Rosenberg, one of Western Pennsylvania’s most respected 20th Century artist/teachers, along with his retropective at the Westmoreland Museum of American Art in Greensburg, PA. Curator: Barbara L. Jones, June 8th -August 24th, 2003. SOLO EXHIBTIONS: MOUNTAINS AND TREES, Estes Park Public Library, Estes Park CO. July 2006; NATURAL SELECTIONS, Eastfield College Gallery, Mesquite, TX. ; MY COLORADO SUMMER, La Cima Club, Los Colinas, Irving, TX. ; IN THE MOMENT, Flatbed Press, Austin, TX. ; PAINTINGS AND PRINTS, Twentieth Century Gallery, Williamsburg, VA.; A FEW OF MY FAVORITE THINGS, University of Texas at Arlington, Arlington, TX. ; THE NATURE OF THINGS, Woman’s Center, Southern Methodist University, DALLAS, TX. PUBLICATIONS BY & ABOUT ARTIST (excluding newpaper articles): Seven publications and a chapter in NATIONAL ART ASSOCIATION magazines and books; DALLAS CALENDAR ARTIST 2007,2008, 2009, 2010. In WHO'S WHO in AMERICAN WOMEN. 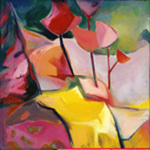 INTERNAIONAL CONTEMPORARY MASTERS 2010 (publication date December 2009). next painting, Rocky Mountain Reflections, oil on canvas, 24" X 24". next painting, Let's Begin the Ravine, acrylic on canvas, 20" X 20". next painting. 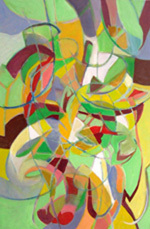 Anya's Dance, oil on canvas (in honor of my Czech Grandmother), 36" X 24". next monotype, Glen Haven Treetalk, monotype, 8" X 8". 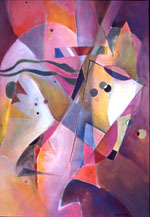 lower left painting, Let's All Do the Kandinsky, watercolor, 21" X 30".